A relatively low-budgeted film, The Cooler features the best in the business when it comes to small production actors. 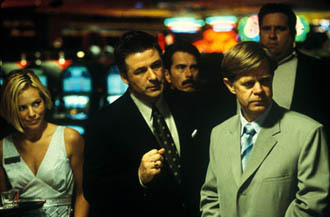 William H. Macy leads this crime comedy as Bernie Lootz, the unluckiest man in Las Vegas. Bernie is so unlucky that he actually cools down anyone around him, hence the title the cooler. Always being able to spot an opportunity when it presents itself, mobster and casino boss Shelley Kaplow, played by Alec Baldwin, devises a scheme to keep Bernie in his hotel and uses Bernie to cool down any gamblers who are on a hot streak. Of course, everything begins to go wrong when Bernie falls for a cocktail waitress named Nathalie, played by Maria Bello.